Well, we all made it back to the states, more of us more or less in one piece. After a long day of traveling, the MSP Airport “Buckle Up” sign on the way out was a welcome sight for us all. Although most of us are well into our weeks, our recent experiences are still fresh in our minds. All in all, the mission was a success. 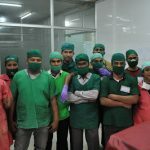 We performed a total of 37 surgeries total, ranging from bilateral hernia repairs to cleft lips. I believe we have strengthened our bond with St. Damien’s and their staff, and we are already planning our next trip back. The goodbyes were all ripe with “whens” not “ifs” which is also telling of the dedication and passion of our team. We all feel a strong bond to this particular site, and whatever the reason for this, it will move many of us to return on successive missions to Haiti. Well, we’re all packed up ready to go in the morning. Quick note tonight tonight as we have a long day ahead of us. This evening we went to the Sugar Cane Plantation for dinner and our Haitian counterparts from the hospital joined us. We made for quite the group as there were 31 of us in all! We really bonded during this time, singing songs in native languages to each other and learning everyone’s favorite animal as we went around the table introducing ourselves for those we hadn’t worked as closely with on the trip. It was really great to be able to spend time with everyone in a social context. It is comforting and encouraging to know that there are people around the world whose work means as much to them as ours does to us. In the end, it’s all about the children, and St. Damien’s really understands that. If you’re reading this and you are going to be collecting one of us tomorrow night at the airport, please make sure you have a pillow for the car ride home (if it’s a long one) and that the hot water heater is in tip-top condition because we’re probably going to want to take a nice, long warm shower. You know you’re on a medical mission trip when the conversations don’t get filtered during mealtimes. Let’s just say the topics are barely fit for the blog let alone dinner. Which, frankly, just adds to the overall experience. Today was another successful day. We got through all 8 cases on the schedule today by 7 p.m., which the entire team appreciated immensely, and were able to enjoy and early an leisurely dinner. A couple notable events today. 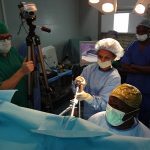 There was an emergency surgery (not our patient) that Dr. Trish scrubbed in on to learn about how and witness the differences between how we do surgery in the states and how particular cases are handled in Haiti. The particular hospital we are at does not have a resident surgeon, so being able to witness a case was a bonus. Yesterday, a patient presented with a severe facial infection which, upon further examination, we determined would not require surgery. We were able to clean up and bandage the area, and today the patient looked better and we’re confident that, with some antibiotics and proper wound care, the patient will make a full recovery. Seeing this condition makes us immensely grateful for our own access to care at home. This infection likely started out as a minor, treatable wound; in the states, it would have never progressed to the life-threatening condition it became for this patient. Another unforgettable moment on the floor today happened with one of our younger patients who had surgery for a cleft lip yesterday. The little girl is very small and undernourished, but she is the happiest, most optimistic baby we have seen this mission. She and her mother traveled over 7 hours to get to St. Damien’s to be screened for surgery, but since they arrived both have been smiles and good spirits. The mother had not brought any formula to he hospital so this afternoon we were able to get some and mixed up a serving of it for the little girl. We didn’t have a bottle, so we put it in a regular cup. Watching this little girl drink, both hands on the cup and practically needing a snorkel, was one of the most enduring memories many of us will take away from this trip. At one point we tried to take the cup away and wipe off her mouth, but with lightning speed she grabbed the cup and continued to gulp down the formula. One very important aspect of follow-up care for the smaller cleft lip patients is teaching the parents how to properly nourish their children. Many cannot read, so showing them the proper mixture of water and formula to feed their children can make the difference for a quick recovery and thriving in the future. Rigan, a nurse who has joined our team for the mission and is doing a lot of the translating for us, has been doing the demonstration and making sure the parents understand what they need to do, and the importance of doing so. On second thought, let’s refrain to saying anything that might jinx the schedule for tomorrow. We will say that we hope to see the city tomorrow, and have a goodbye dinner planned with our team and a few of the hospital. I think that the only expectation for tomorrow is that the bar at the restaurant has a well-stocked bar. Most of us started out the day asking “what day is it again?” which is an indication of how hard and fast we’ve been running. And we’ve been on our feet for so long most of us have rather impressive cankles. For future volunteers on this mission, may we suggest compression stockings? We started at 8:30 again this morning but thankfully were able to get through all 5 clefts and 3 hernias by 8 p.m. this evening. We did end up moving two cases from today to tomorrow to even out the schedule, so we’ll have 8 tomorrow as well; three are scheduled for Saturday. Trish Cabrera, our floor nurse for this trip, deserves to be highlighted today. For the past three days, Trish has been on the floor keeping tabs on the children awaiting surgery, those arriving for surgery, and those recovering from their procedures. We all agree that Trish has one of the most difficult jobs on the trip: monitoring, vitals, charting, IV’s, meds, parents’ questions, the crying, wound care and making sure the kids don’t rip out their stitches, discharge coordination— the list goes on. The floor is definitely the most patient intensive aspect of the mission, and when you consider the language barrier as well as the differences in practices, not to mention the temperature on the ward has to be well over 90 degrees, this position is certainly one of the most intense jobs on the mission and we (well the children, really) are lucky to have someone so dedicated, passionate, and skilled working on the floor. Trish is doing an amazing job on the floor een with everything she has on her plate. The one saving grace for this position though might be that she gets to witness the parents reactions when they see their child for the first time when they return to the floor after surgery. The reunion is always very emotional, filled with gratitude and relief. It is priceless to witness. One of our patients today was a very small girl with a cleft lip who, for various reasons, we initially said we wouldn’t do on this trip. 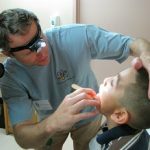 But after speaking with the family, we were persuaded to go ahead with the surgery because they wouldn’t be accepted at home unless their child’s lip was fixed due to to stigma associated with the condition. When the child and parents were finally reunited after surgery, the smiles were so impossibly wide, we knew we had made the right decision. As mentioned before, we have 8 cases tomorrow; 3 scheduled clefts and 5 hernias. Our goal is to be done again around 8 p.m. so we can get a good night sleep and try and get an early start Saturday as we have various activities planned for Saturday afternoon which we want to be done by 1 to get ready for. With only three cases Saturday though, this should be very doable. It’s almost 10 p.m. and we have been doing surgery for over 12 hours now. The closure of this final case will mean the successful completion of 11 surgeries, anatomical remedies for 11 children, and relief for 11 families. Our work will never be done in Haiti, but the individual lives of the children we help on this mission should not be overlooked in light of the overwhelming need. Dr. Eric Moore arrived today, so tomorrow we start the cleft cases. He will do all 6 in the morning and then Dr. Trish will finish up the day with 4 more hernia cases. All patients from yesterday were discharged before noon with no complications, and instructions to follow-up with the hospital in a week. We were able to get an earlier start and worked hard to keep the schedule moving. In addition to the 11 surgeries done today, we also screened 6 more patients, and are expecting more tomorrow as well. As of now, our goal is to fill the schedule through 3 cases on Saturday. In truth, Wednesday’s success was brought to you in big part by our float nurse, Norie Wilson. Norie deserves to be highlighted today for her coordination, level-headedness in the face of potential chaos, and ability to keep everyone moving. Between keeping track of patient discharges, new patient admits, the surgery schedule, where each patient needs to be when, who is where when (patients AND team members), and what who is doing what where when, monitoring patient screening, and dealing with the random “situations” that arise, Norie’s coordination is essential to a successful mission. We are all so grateful for her “be calm and carry on” attitude as well as her universal understanding of how missions work and her ability to make it look effortless (she really embodies the essence of a “float” nurse). Although, don’t be fooled; Norie is working really, really hard. Today was a testament to the fact that, while we may have fun on the missions (and in our blog), our ultimate goal is to make a difference in the lives of our patients and their families. 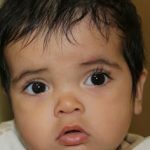 Although they are often the most simple to fix, cleft cases are also the most heart wrenching. 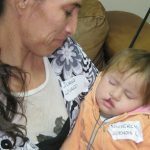 We were reminded of this in a big way when one family relayed how important it was their child receive surgery, as they had been all but driven out of their village due to the stigma associated with their child’s cleft lip. One of our patients is a teenage boy who was abandoned because of his appearance. It’s stories like these which keep us coming back, because we know how dramatically a simple fix can alter a child’s life. The understatement of the trip is that we’re wet. Really, really wet. Evidently it’s the rainy season in Haiti, and only Scott, the anesthesiologist on the trip brought an umbrella, which he made a conscious decision to leave in the compound when we went to Mama Rafael’s down the road this evening. Not that the umbrella would have helped. I am not exaggerating when I say that the type of rain we had in Haiti this evening would have caused every news station in the twin cities metro area to interrupt your regular broadcasting to show you the latest picture of a flash flood carrying cars and garages down the street. Torrential is an understatement. Mama Rafael’s is about 1/4 mile from the hospital, and we waded through knee-high rains along the road most of the way back to the hospital. We did finally all make it back safe to find the power strips in our tents floating in 3 inches of water. I’m sure your first thought was, “huh, I always wondered if those floated.” Well, now you know. We did actually see children today and have a productive day of screening and set-up. We screened 20 patients, most of whom are candidates for surgery and will be seen either Tuesday or Wednesday. The interpreters are excellent, and a few of us know French (and a little Creole!) which is helpful. We had a little time in the afternoon to spend on a few of the wards. Many went to the NICU to see the babies, others visited the “fish room” which is what they “named” (they use pictures rather than words) the room where they put children abandoned while in the hospital. These little ones are so starved for attention and it’s hard not to spend the entire afternoon with them. We have 10 surgeries lined up for tomorrow, and the plan is to start around 8:30. The trick for the day, however, will be keeping the schedule moving while screening new patients which will require Dr. Trish (our pediatric surgeon) and Dr. Pete (our pediatrician) to bounce between clinic and OR/ PACU to screen and approve new cases, but our well-rested (albeit water-logged) team will surely make it look like a walk in the park. They promised us today that if it rained again we could sleep in the houses reserved for long-term volunteers instead of our canvas abodes. Of course, that was all they had to say to keep the rain away. At least we’re dry! Day 1 of surgery went very well. As expected, the trick was to both screen in new patients and get through the 10 surgeries we had on the schedule. Since both Dr. Pete and Dr. Trish have to see each new screen, this meant a full day of musical doctors. The good news is we did both; 10 successful surgeries and 21 new patients screened. The better news is that our team is now ranked in the International Musical Doctors League. Rah rah! Tomorrow promises to be busy as well; with 11 surgeries scheduled for the day it very well may be another late night. We also expect around 10 new patients for screening, but since we have the musical doctor things down pretty well that should go smoothly. Surgeon Eric Moore joins us tomorrow; he is coming down to perform the cleft surgeries and should arrive at the hospital around 4 p.m. He won’t start cases until Thursday however. We will continue to fix hernias Thursday and Friday in addition to the cleft patients; right now the schedule is set-up for half and half both days which will be a nice break for Dr. Trish (who has actually given up chewing to save time between cases). We are all really excited by the work being done, and are eager to keep the momentum going into the rest of the week. This trip is a learning experience on so many levels and is opening eyes and doors to so many different aspects of our mission as a whole. The Fall 2011 mission to Haiti is officially underway! Our team of 11 team members met at MSP this morning bright and early at 4:30 a.m. to catch our 6 a.m. flight to Miami. One layover, one additional hour delay, and a slight baggage snag post-boarding and we were off to Haiti. This is CSI’s fourth mission to Haiti, and our third time to this specific location. St. Damien’s Hospital is located in Tabarre, which is a district of Port au Prince. This is the first mission to this location however, that we will be doing cleft surgeries. Past missions have focused on other types of semi-elective surgeries such as hernias and other analogous cases. The St. Damiens campus is very well kept and well guarded so we feel safe within the compound. The set-up is the same as on previous missions; MASH style tents and a common grub area will be our home away from home for the next week. 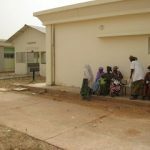 We arrived at the hospital around 5 p.m., greeted by Sister Judy, and were given the “run-down” for the living quarters, a tour of the hospital and brief of other logistical considerations. After dinner and a quick team meeting, team members started winding down for the day in preparation for a full day of screening and set-up. Our days will begin at 8:30 a.m. Tomorrow (Monday) morning, we will be screening and setting up the PACU, floor and OR. Tuesday through Friday will be our surgery days. Wednesday we will be joined by ENT surgeon Eric Moore who will perform the cleft lip cases. We’re all VERY thankful for internet access, and hope it will stay up for the week. No promises but if it’s up, expect an update! St. Damien’s is the only pediatric hospital in Haiti and going from the chaos and disarray outside through the gate is profound. We were met by Sister Judy and given a tour of these beautiful grounds and facility so we could see everything – there is a large ER, an OR and even a neonatal ICU here – these are overly full with lots of children, some of whom are weak and very ill, others who are on the mend and will do just fine. The team worked together to unpack supplies and match them to where they would be used. 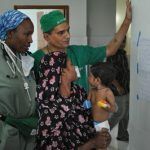 We reviewed our surgery list and readied the team to screen kids in the morning to begin surgery on Sunday. George, the chief of logistics in charge of making sure the medical teams can do their jobs well, spoke with Sister Judy to get updates as to how many kids we might expect on this mission. We will see at least 30 children to determine who will be taken in for surgery. St. Damien’s happens to be directly next to where the UN has set up camp and we see the large operation as we headed off the grounds to go to the grocery store – it was filled with dozens of UN soldiers from Brazil, Nepal, Italy and Jordan so we squeezed our way through the aisles for our supplies and returned back to the hospital grounds. There is a lot of multiculturalism in Haiti now – we hear the calls for prayer from the Jordanian camp several times on our first day. We’re also told that they start at 4:30 AM – that could end up being some kind of wakeup given our long flight to Port Au Prince. Our first day ended with us having an amazing chicken dinner at Mama Rafael’s, on the hospital grounds, and then hitting the showers – they are cold but felt very good.